Connectors in Kafka Connect define where data should be copied to and from. A connector instance is a logical job that is responsible for managing the copying of data between Kafka and another system. Connector plugins are jars that add the classes that implement a connector. Both connector instances and connector plugins may be referred to as “connectors”, but it should always be clear from the context which is being referred to (e.g., “install a connector” refers to the plugin, and “check the status of a connector” refers to a connector instance). Tasks use converters to change the format of data from bytes to Connect internal data format and vice versa. 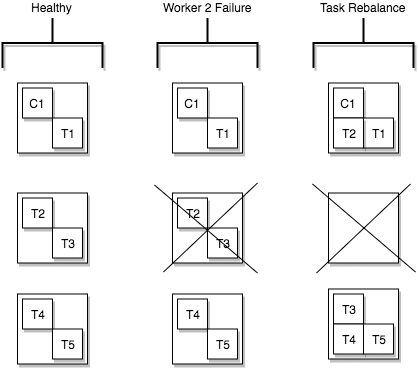 Converters are decoupled from connectors themselves to allow for reuse of converters between connectors naturally. 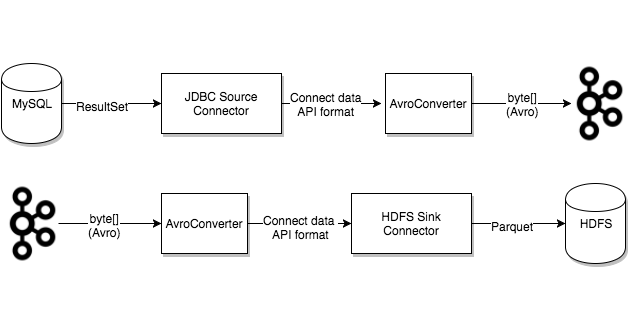 For example, using the same Avro converter, the JDBC Source Connector can write Avro data to Kafka and the HDFS Sink Connector can read Avro data from Kafka. This means the same converter can be used even though, for example, the JDBC source returns a RecordSet that is eventually written to HDFS as a parquet file. The details of this conversion process are not typically important to users of Connect. However, users should understand that converters are necessary to have a Connect deployment support a particular data format when writing to or reading from Kafka. Users of the Confluent Platform are given converters for Avro, JSON, and String initially. We recommend using Avro where possible.